Parrikar, who was the defence minister between November 2014 and March this year, when he resigned to become the chief minister of Goa, was speaking at a run organised at Panaji. 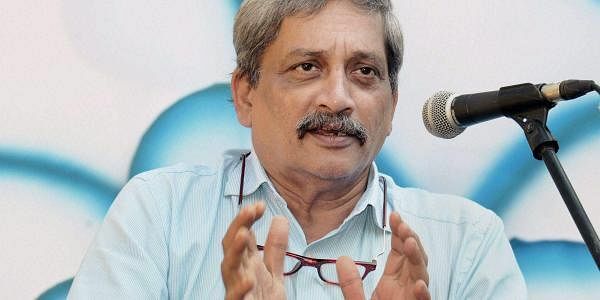 PANAJI: Former defence minister Manohar Parrikar today said that during his tenure, he tried to address the problems faced by the soldiers disabled due to injuries received in the line of duty, but "what we did was nothing" as many issues were long-pending. Parrikar, who was the defence minister between November 2014 and March this year, when he resigned to become the chief minister of Goa, was speaking at a run organised here. He also said it was great to sacrifice one's life for the country, but the spirit should be to kill the enemy and not to get killed. He also lauded the sacrifices and contributions made by soldiers and their families, including war widows, in protecting the country's borders. The event was hosted by Major (retd) D P Singh, a Kargil war veteran and the country's first amputee marathon runner. "We worked together on a number of issues, particularly about the soldiers who are disabled. I am happy to say I did quite a bit for them, whatever I could do as a small contribution to our brave soldiers," he said, referring to the joint initiative taken by the ministry and Major Singh. "What we did was nothing, many issues were pending for so long," he added. Parrikar noted that the country's soldiers have always displayed high level of patriotism and made sacrifice for the nation, as he also saluted war widows for "they have contributed part of their heart for nation-building". "We cannot forget their sacrifices to protect our borders," said Parrikar. He said Major Singh wanted to serve the country but due to his injury he could not do it. "But even after that, he has put up an artificial limb and is more active than a normal person." Talking to reporters on the sidelines of the event, Major Singh said, "Before the Kargil war, I was like any other person. The war made D P Singh an amputee. I became a blade runner and started an NGO," he said.